Welcome to Café du Sud – DESERT HOTEL. 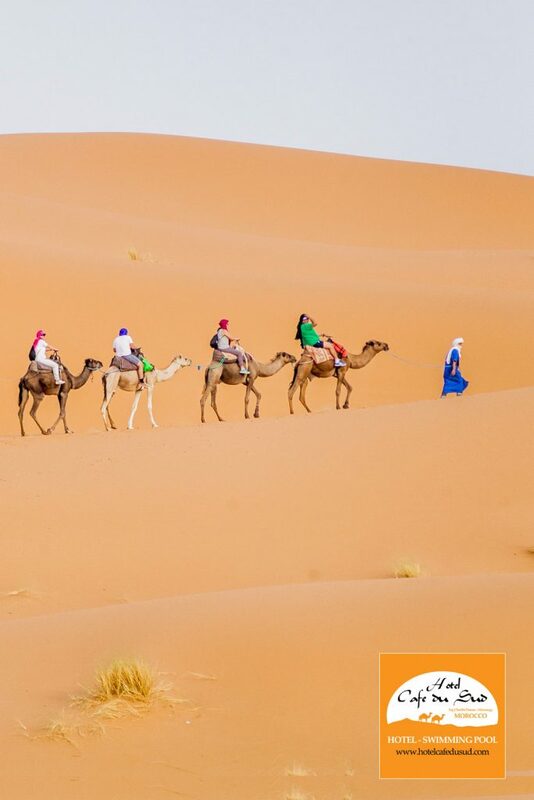 Experience exceptional welcoming service and comfort amid the mystic desert charm of Moroccos’s Sahara Desert. 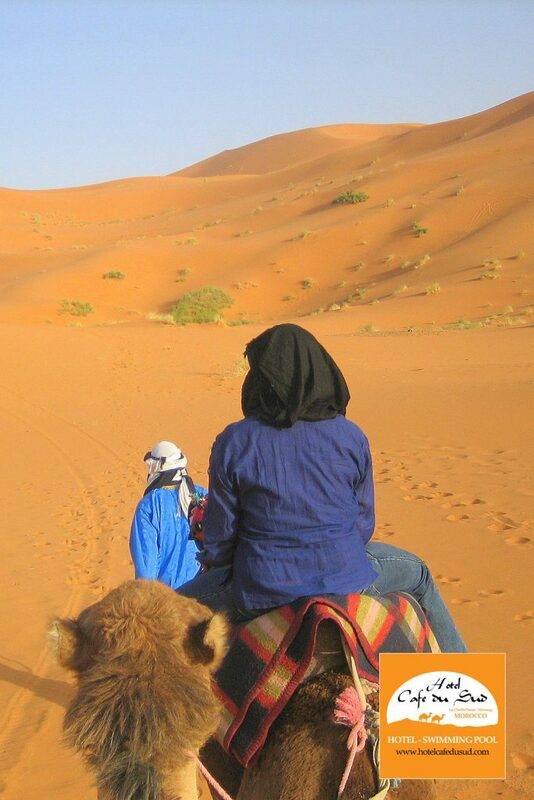 Ride on a camel over sun-soaked dunes as this astonishing landscape unwinds in front of you. Soak in our refreshing swimming pool while beautiful landscapes surround your eyesight. 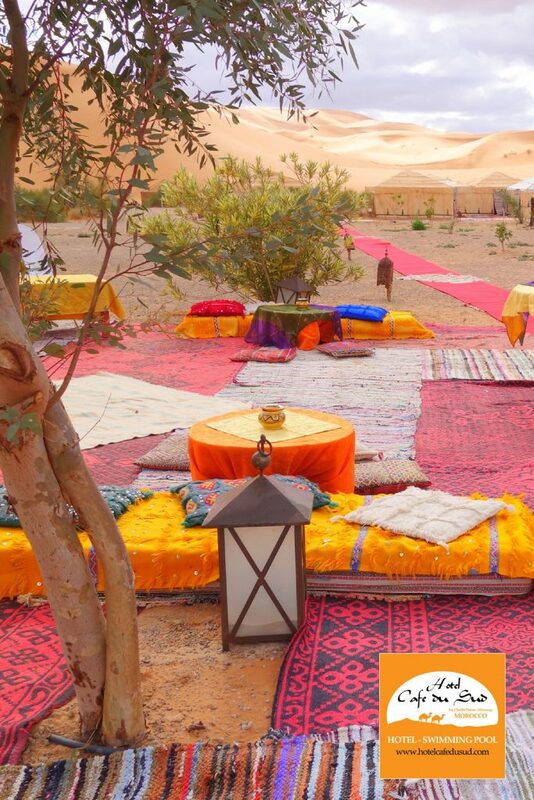 Be inspired by renowned Berber and Arabian décor, that showcases the best design of this little corner of North Africa. Hotel Café du Sud is much more than a hotel. It is somewhere you can loosen up, enjoy yourself and feel instantly at home. So whether you’re coming to chill out, or just to have fun, you can be reassured of a very warm welcome – hehehe – especially in the summer! After a day of enjoyment, relax and mingle the restaurant area. 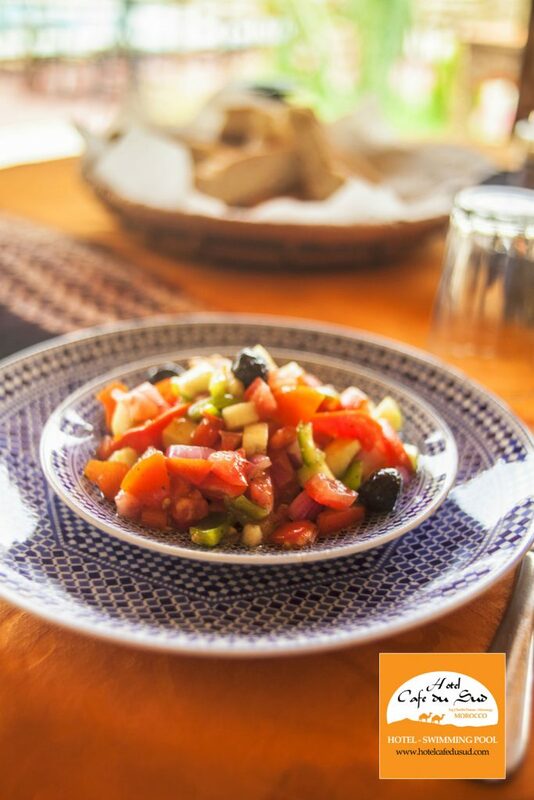 The Café du Sud Restaurant offers hearty dining and house specialties made with fresh local produce in a relaxed atmosphere filled with friendly staff. 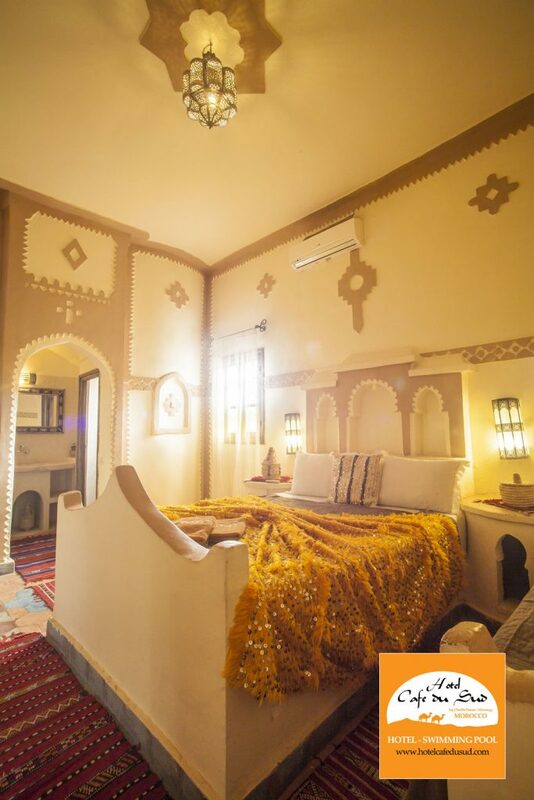 ► Read more about our desert riad. 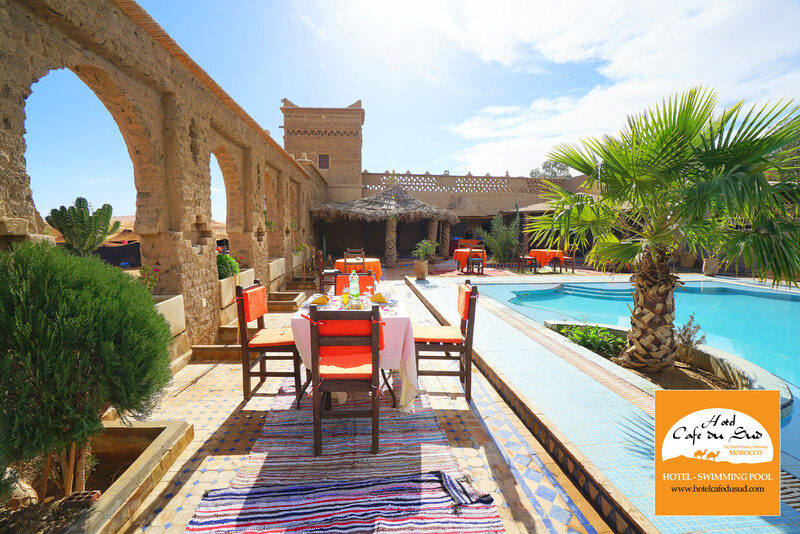 Hotel Café du Sud lies in an oasis deep in the Erg Chebbi Dunes, where dromedaries, exotic birds, and desert foxes are often seen. 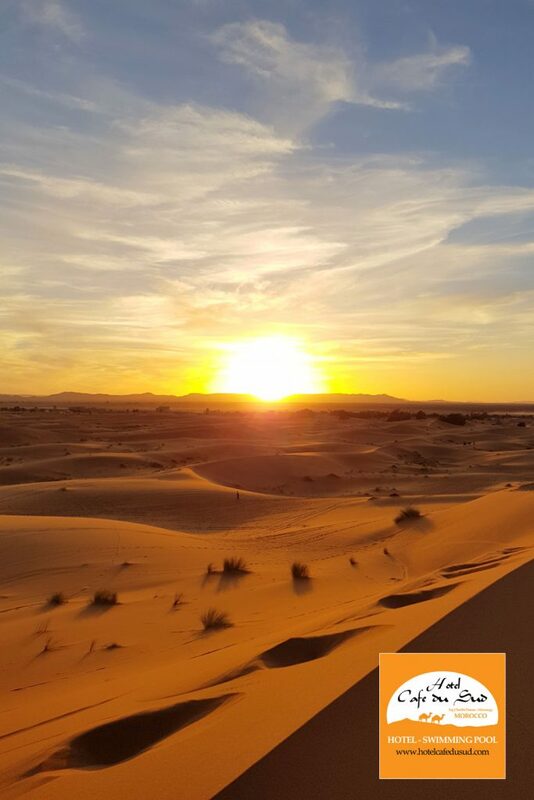 This hotel in Morocco offers accommodation, swimming pool, restaurant, desert 4×4 excursions, camel trekking, bivouac and desert camps, quad ATV activities, sandboard and dune trekking. 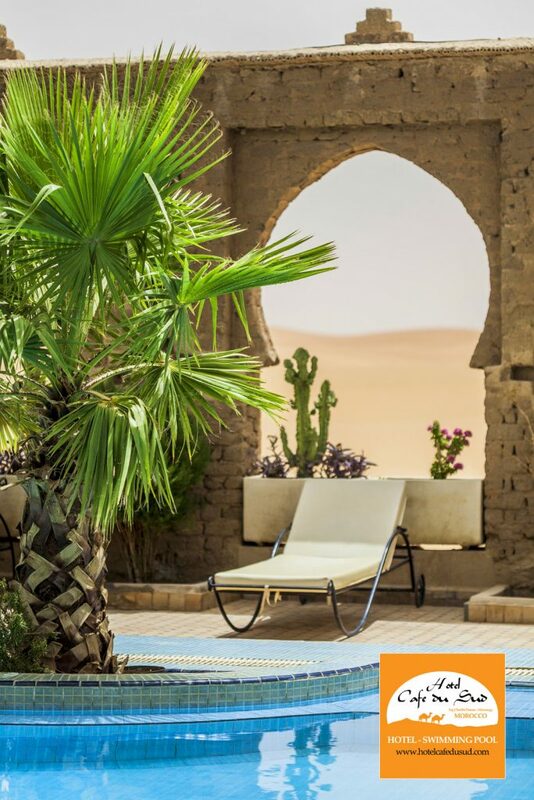 With private terraces and open-air communal areas, so you can enjoy the world’s clearest skies, this desert hotel is the perfect place to enjoy the very best of your Moroccan holidays. 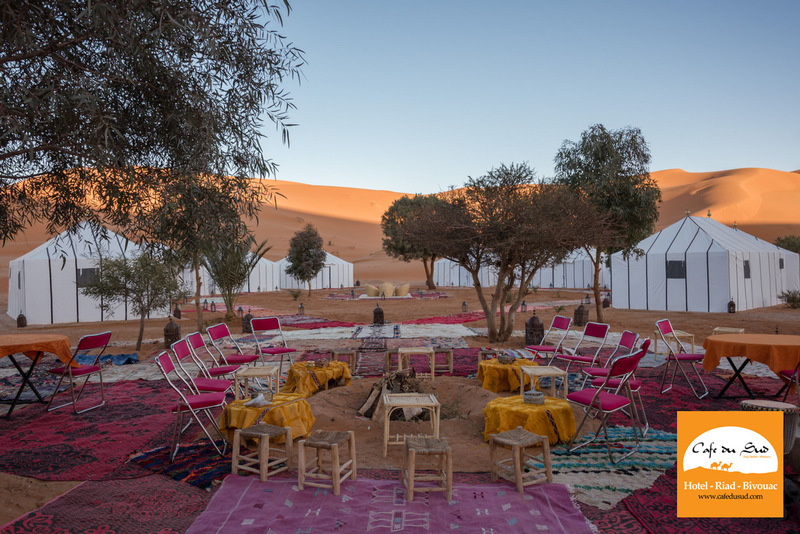 Hotel Café du Sud loves bringing people together and our conference rooms or desert tents provide a stylish setting for memorable weddings, meetings, motorized competitions or any type of events. 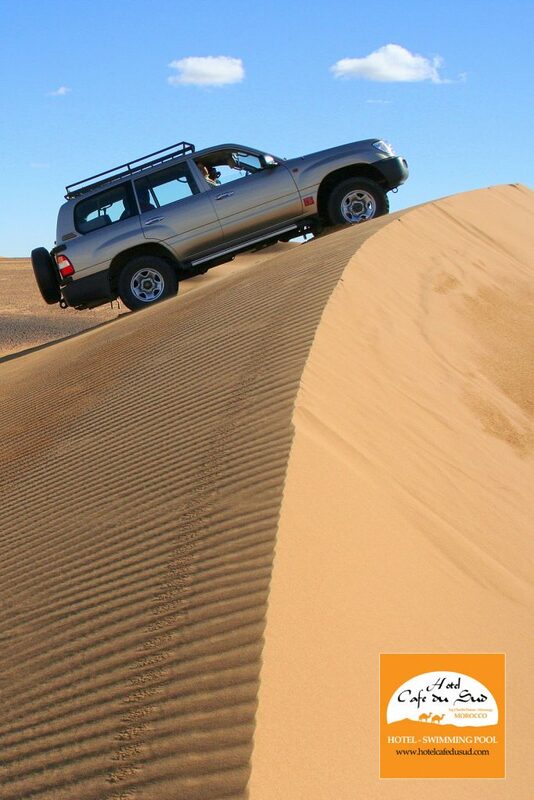 ► Read more about our desert camps. 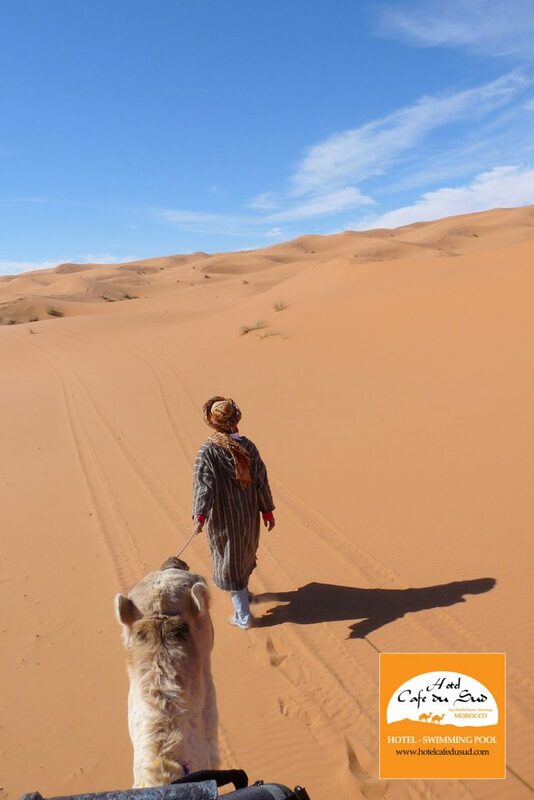 Imagine yourself riding a camel through the Sahara. Arriving at your destination amid the desert with nothing around you but the dunes and all you can hear is the sound of the wind. 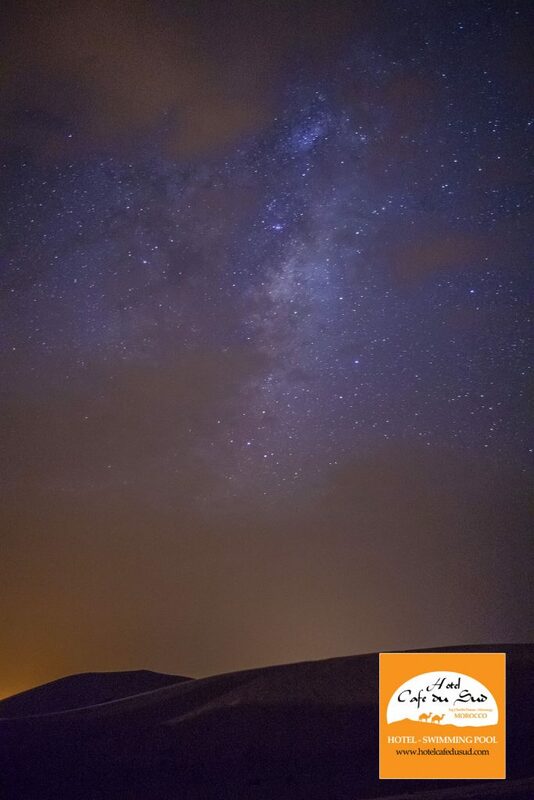 At night, dinner is served under a sky filled with millions of bright stars. It is an experience well worth the effort and you will keep memories that will last forever. 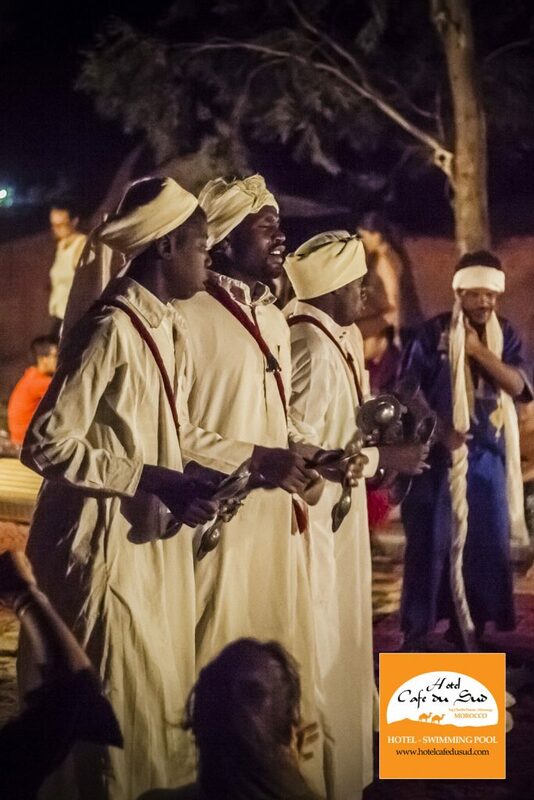 When it comes to designing camel trekking rides, we want to offer you the best holidays ever. The hotel is decorated like a Hollywood Indiana Jones set, including the rooms. You can live the fantasy and still get room service. After 3 days in the dunes, we were ready for pampering and we got it. Hot water, comfy bed, plenty of food, plenty of heat. The bivouac tents were very nice too. They are far into the dunes. Still, there were nice beds, carpets, plenty of blankets, hot showers, food. Everything is fantastic about this resort. They were very welcoming and had an excellent spread of dinner and breakfast. 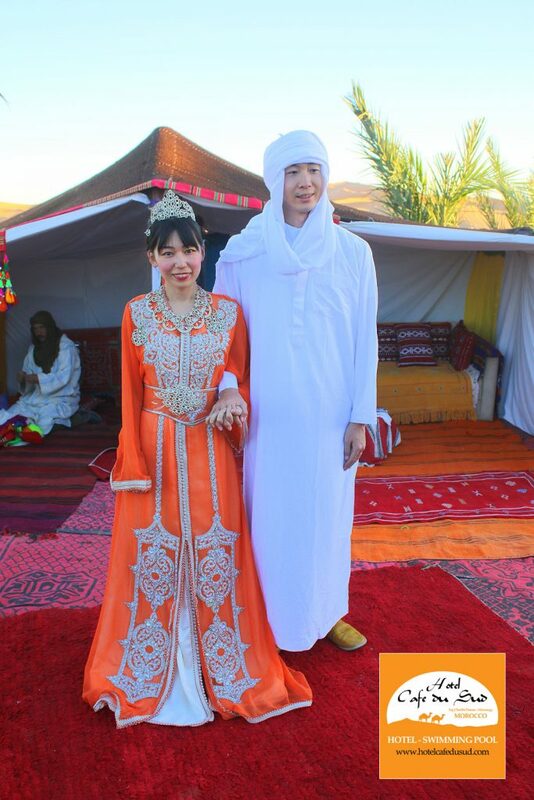 They even gave us turbans to wear when we headed to the desert safari. They played music at night next to the bonfire which was an awesome experience. ► Read more client testimonials here.